BUYSOUNDTRAX Records is proud to present a new recording of the score for the 1985 fantasy film, LEGEND, featuring music composed by electronic music pioneers Tangerine Dream (SORCERER, THIEF, RISKY BUSINESS) for the fantasy film directed by Ridley Scott (ALIEN, BLADE RUNNER, THE DUELLISTS), written by William Hjortsberg and starring Tom Cruise, Mia Sara and Tim Curry. Tangerine Dream’s electronic music for the film is presented here in a new recording produced and arranged by composer Brandon K. Verrett. LEGEND is a visually stunning fantasy/adventure that takes place in a mythical forest inhabited by fairies, goblins, unicorns and mortals, where an epic battle of Good versus Evil begins to unfold. Tom Cruise plays Jack, a peasant boy in love, perhaps tragically, with the beautiful princess Lili (Mia Sara). Jack and Lili become pawns in a much larger game as the Lord of Darkness (Tim Curry) exploits their relationship to reveal the location of the remaining members of the purest race in the world, the last pair of Unicorns. He dispatches his goblins to kill the Unicorns and claim their horns, so that he may claim their mystical power and bring about an everlasting age of Darkness. Jack finds himself forced to undertake a quest, to save Lili, try to prevent the death of the last Unicorn and defeat the plans of the Lord Of Darkness, or the sun will rise no more. The music for LEGEND was a subject of great controversy in 1985. Initially, Ridley Scott had turned to composer Jerry Goldsmith to score the film, which would reunite them after their great success on ALIEN in 1979. Goldsmith responded by writing an enchanting, organic symphonic score emphasizing strings, woodwinds and choir, a score that the composer, the director of the film and many others felt was among Goldsmith’s best work. After a disappointing test screening, studio executives encouraged Ridley Scott to replace the music with something that would be more commercially appealing to the film’s expected youth market. Tangerine Dream had realized great success with their score to RISKY BUSINESS in 1983, another film aimed at the youth market and so they were hired to compose a brand new score for the film. Tangerine Dream ultimately composed 80 minutes of music for LEGEND, using 35 different synthesizers, yielding a score that many feel is the group’s finest musical endeavor for film. Despite inevitable comparison between the two scores, the music that Tangerine Dream composed for the film was extremely effective and remains their most lyrical and complex work for films, from the delicate melody for Nell’s Cottage, the hauntingly fragile melody for the Unicorns, the crackling percussive motif for the Goblins and and the pervasive dark synthetic pulses associated with Darkness. In the spirit of BSX’s fondness for reinterpreting significant film scores new musical presentations, composer/arranger Brandon K. Verrett has created a new performance of Tangerine Dream’s music for LEGEND, keeping an eye toward respect for their original performances and ear toward the sounds of today’s technology. With this new performance of the LEGEND score, album producer Ford A. Thaxton wanted to bring out the many beautiful elements that existed within Tangerine Dream’s music but could not be realized with the gear used in 1985, taking into account how much technology has changed in 27 years since the music was first recorded and giving it a fresh face, utilizing the modern digital instruments of 2012. To prepare for the project, composer Brandon K. Verrett thoroughly studied Tangerine Dream’s complete score. His intention for the new recording was to stay true to the familiar soundtrack performances of the original score but to do so while retaining the freedom to put his own musical stamp on the presentation. According to the composer, “Those who are familiar with the original score will find subtle changes in tempo, musical gestures and timbre. Some of the interpretations may be found to be fairly literal. Other tracks seem to invite more development and exploration and with those tracks, I allowed myself to explore Tangerine Dream’s material and to paraphrase using my own compositional vocabulary.” While the original score was composed largely on synthesizers, this new recording of LEGEND retains the original organic concept of the instrumentation, augmenting it with violin, erhu, piano, guitar, voice, cello and other exotic instruments, carefully molded to bring the music alive. This mindset extended to the songs featured in the film and this new recording of LEGEND also includes new presentations of the classic songs “Loved By The Sun” and “Is Your Love Strong Enough”, featuring the voice of singer Katie Campbell. BUYSOUNDTRAX proudly presents LEGEND – MUSIC FROM THE MOTION PICTURE, featuring a new exciting recording of music composed by Tangerine Dream, produced and arranged by Brandon K. Verrett, featuring vocal performances by Katie Campbell. LEGEND – MUSIC FROM THE MOTION PICTURE includes exclusive liner wrotes written by noted author Randall D. Larson, detailing the history of the film’s music and new comments from composer/arranger Brandon K. Verrett related to the development of the project. 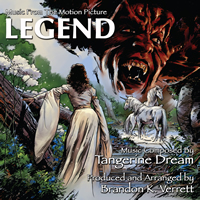 LEGEND – MUSIC FROM THE MOTION PICTURE also features striking front cover and rear tray artwork produced by noted artist and illustrator Jerry Bingham (BATMAN: SON OF THE DEMON, BEOWULF) that is exclusive to this release. LEGEND – MUSIC FROM THE MOTION PICTURE is a limited edition release of 1500 units. The first 100 units ordered from our website will include a booklet signed by composer/arranger Brandon K. Verrett and singer Katie Campbell.